This is what I get for trying a new starter. This was not sour. I'd love to find out why. Write-up is here on my blog. Seriously, best tasting bread ever. At least to me. But it isn't sour. It's complex. Kinda nutty. But no tang at all. I think my starter is more yeast than bacteria. Sourdough does not necessarily = sour flavour! It's a common misnomer that sourdough bread should be sour! Not necessarily. There are ways to increase the sourness if that is what you're after, but if you're turning out flavoursome bread you enjoy, that's fine! I have an MP3 of an excellent radio segment that was broadcast on one of the Australian radio stations last year but is no longer available online in their archives. I am intending to post it on my blog once I get around to finishing the writing up. You may or may not be interested in listening to it, but I can tell you that one of the world's foremost authorites on sourdough bread is interviewed and makes this very point - that people expect sourdough to be sour and question its authenticity when it's not. He attributes this misunderstanding of the nature of SD to the name 'sourdough', which he points out just means natural leaven. I think it is also due to the famous San Francisco sourdough, which IS sour, and which many people equate - incorrectly - with the quality of sourdough generally. Anyway, enjoy your bread without concern that it is in any way a failure if it does not actually taste sour! PS: You'll probably find that the sourness of your breads will increase once your summer arrives. I began my starter during winter and my breads had no sour tang at all...but now that it is summer here and the inside temps are high 20C+, my starter is producing more of a sour flavour in my breads. I've seen the explanation, but won't bore you with details here - which I struggle to recall, in any case, without reference to the book that was the source of the explanation. Agreed -- so what do we call sourdough? I'd like to hear that segment too, Ross. And I heartily agree, just because we call our starters and breads sourdough doesn't mean they are sour. But what else to call the starter? I think levain is poncy for English-speakers. I tend to go with "starter", and then if people ask what kind of starter I may add natural yeasts (or natural ferments so as not to exclude our bacterial helpers). Ross put this very well. Ross put this very well. Sourdough makes for excellent bread without needing to be sour tasting. I would like to add that if you strive to obtain sour flavor, be careful what you wish for. 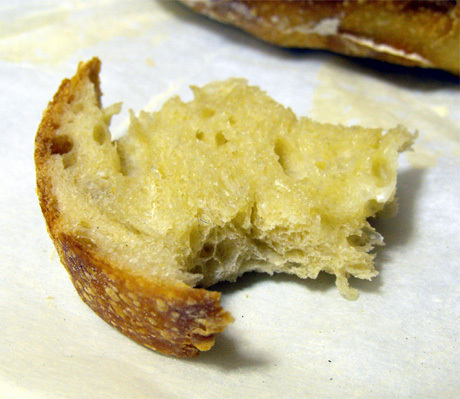 Once obtained, you may find out that you don't really like sourness in your bread to begin with. One time someone sent me some starter culture from San Francisco and my bread came out with a kind of a cheezy tang to it, which I really did not care for. Your recipe includes completly white flour, a recipe for which can be a struggle to get sour out of anyway, so try addition of some rye or whole wheat, sourdough recipies using these additions can be overpoweringly sour. .Experiment with fermentation until you obtain sour and decide if it is really what you want. I know it doesn't necessarily mean sour, but normally this build, with such little starter, would give me a pretty sour bread. Usually is in the summer, though. What should we call our breads, then? And what is the actual definition of sourdough? I noticed on Susan's (of Wild Yeast) blog that a few of the commenters on the La Brea Bakery bagels complained that they weren't really sourdough because of the addition of commercial yeast. While that may be true, sourdough is a really complex subject and there are a lot of types of bread that fall under the umbrella of the term, and some that people tend to put there because they have starter in them. My completely naturally raised multigrain bread that I sweeten with honey is, out of my desire, not sour. I use larger amount of culture and the honey sweetens the loaf very nicely. It's meant to be a sandwich bread and the flavors were meant to be paired with smoked meat and salty cheese. If the bread would take on a sour tang it would be almost ruined. I think I was so surprised by the lack of sour of this loaf because of how the original levain was when I used it. I'm now wondering if there would've been slightly more sour if I'd used a larger amount of levain in the final build instead of such a small amount. In the summer, the small amount of levain would allow for a longer period of time in which the lactobacterium could multiply and become more sour...perhaps a lack of bacteria is one of the problems and a few feedings with rye or even part rye would sour it up a bit. I'll try it. Yes, that definition issue is a hot one - certainly where I live. There's been a bit of a war between large bakery franchises that are trying to commercially exploit a growing community awareness of sourdough bread by advertising breads as 'sourdough' that have some natural leaven in them, but are spiked with other yeast. The definition of sourdough bread put forward by the traditional sourdough bakery groups is bread that is wholly naturally leavened. That is, ONLY naturally leavened. So, bread spiked with other yeast does not qualify in terms of their definition. I would agree with that, but I can see that there could be valid arguments against this view. Macdonalds in Australia are currently trying to cash in on sourdough's growing reputation as quality bread, advertising their new Angus Beef burgers as being enclosed between sourdough buns. I had one of these out of curiousity - perhaps sheer perversity, actually, as I'm no fan of Maccas gastronomically or as a multinational organisation that has shown itself to be less than aligned with the sorts of values I hold dear. Anyway, I can tell you, the 'sourdough' roll is a soft, tasteless abomination of a thing, with zero in common with any genuine SD bread I have tasted. I'd be amazed if they put ANY natural leaven in it. If that is the case, they should not be allowed to advertise it as sourdough. None of this is getting much closer to a workable definition, I guess. I am happy enough just to continue calling 100% naturally leavened bread 'sourdough', and qualifying the description of any other bread appropriately. Given more extreme cases such as Macdonalds, though, I do think there's a need for a legally agreed upon definition of 'sourdough'. Oh yeah, sourdoughbaker, I agree that it's entirely valid to use dry yeast etc in otherwise naturally leavened breads - the only question is the categorisation of the bread. I reckon 'sourdough' should only be used to describe 100% naturally leavened breads, and all other breads should be distinguished from 'sourdough' in some way. Your term 'semi-leavens' is a good as any I've come across. Sourdough Rising - The Home Artisan Bread Baking Revolution. Not just the audio segment, which is great, but your placing of an interest in home baking in its wider context is excellent. And I learned a great new word: white-anting. thanks. But what do we do about the name "sourdough"? Natural leaven still sounds a bit pompous. Glad you connected with that perceived integration of home baking with the other trends and movements that I see as potentially changing the shape of our world. It's the most significant point of my post, and one I intend expanding upon separately in some depth (wasn't the place to put the proposition to further investigation). I'm happy to continue with sourdough. But if something better catches on, I'll happily switch buses! PS: I agree that 'natural leaven' sounds a bit pompous - a bit unwieldy, too, I reckon. My vote goes to 'wild yeast' (if have to vote). Stephanie Brim's Recent Blog Entries.